The country is awash in conformist state worship, fueled by the shrill narrative of a war on terror. January 25, 2011, was a transformative moment for Egypt. Thousands of protesters flooded the streets to call for the downfall of Hosni Mubarak’s sclerotic regime, confronting the notorious security forces on National Police Day and sparking a mass uprising that reverberated around the world. This year, January 25 brings with it a feeling of the revolution’s undoing. A crude monument erected by the new military-backed government stands in the center of Tahrir Square—once the epicenter of autonomous mass mobilization, now a space controlled by the state and its security forces. Three protesters this week were sentenced to two years in prison for defacing the structure. The ruling barely registered in the news. State and private media are dominated by pro-regime viewpoints, while dissenters are demonized. Public debate has been mostly shut down, and political discussion with strangers is once again a risky endeavor. Surveillance recordings of activists are leaked and aired on television, with presenters vilifying them as traitors. Hotline numbers for Egypt’s security agencies run in scroll on the bottom of many TV broadcasts so that people can call and report suspicious activity. This is Egypt’s own brand of McCarthyism. The Muslim Brotherhood has been the primary target. Hundreds of members have been killed and thousands imprisoned. In December, the government declared the group a terrorist organization and froze the assets of more than 1,000 affiliated charities and organizations. Even so, Morsi’s supporters have continued demonstrating on a near-daily basis throughout the country, risking beatings, imprisonment and death. Meanwhile, university campuses have emerged as the new front lines of dissent, with students protesting the crackdown and frequently clashing with police. The redoubled authoritarian measures have done little to bring stability. Bombings and shootings that target security forces have now become commonplace, with more than 250 police killed in the past few months. On the morning before the third anniversary of the revolution, three bombings hit high-profile areas in Cairo, including a massive blast at the city’s police headquarters. Five people were killed and scores were injured. The Brotherhood quickly issued a statement condemning the bombings. Many suspected the involvement of Ansar Beit al-Maqdis, a Sinai-based militant group that has claimed responsibility for previous attacks. At the site of the police headquarters, passersby stared in disbelief at the deep crater left by the car bomb. The facade of the building was mangled, with air-conditioning units dangling from shattered windows. The blast tore through nearby buildings, including the nineteenth-century Museum of Islamic Art. Over the past few months, the crackdown has widened far beyond the Brotherhood, however, with the regime arresting prominent activists, scholars, journalists and public figures who dare to speak out. Egypt’s jails are bursting with prisoners. Every day, new charges are levied at those who do not toe the official line, while a repressive new law bars ten or more people from gathering in public spaces without prior police approval. The judiciary and prosecution—which have tried Mubarak-regime figures at a glacial pace, often acquitting them—have become models of efficiency in jailing and sentencing opposition voices. “The Egyptian authorities are using every resource at their disposal to quash dissent and trample on human rights,” said Amnesty International in a damning new report published ahead of the third anniversary of the revolution. “Three years on, the demands of the ‘25 January Revolution’ for dignity and human rights seem further away than ever. Several of its architects are behind bars and repression and impunity are the order of the day,” said Hassiba Hadj Sahraoui, Amnesty’s Middle East and North Africa deputy director. 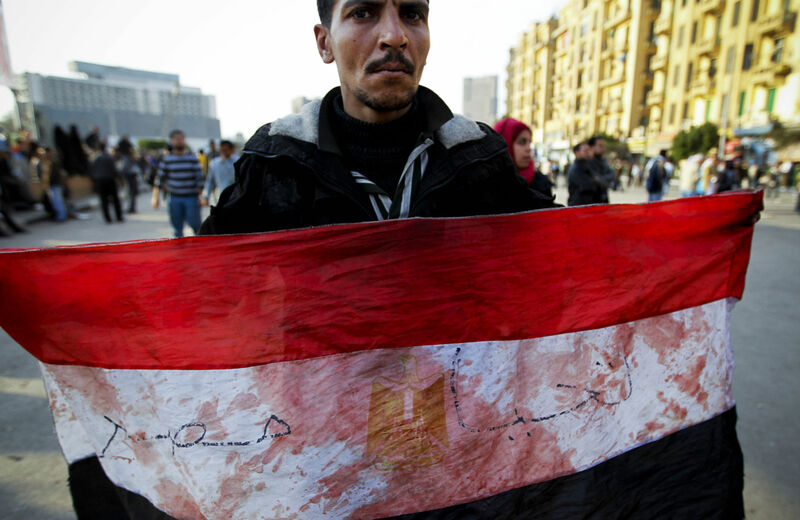 In mid-January, the interim government held a constitutional referendum, Egypt’s third in three years. The vote was hailed as an important step in conferring democratic legitimacy to the military-backed transition. In Cairo’s working-class district of Sayeda Zeinab, voters lined up outside an elementary school to cast their ballots. Helicopters roamed the skies while police and army soldiers manned the entrances. The pro-army pop song “Tislam al-Ayadi” (Blessed Are the Hands) blared from speakers set up nearby. Large banners, many of them sponsored by local businessmen, were strung between lampposts, all of them calling for a “Yes” vote. The new constitution replaces the 2012 version pushed through by the Muslim Brotherhood. Many analysts have pointed to improvements in the amended national charter, including clear language on rights for women and children, as well as language reining in the role of religion. Yet the document also grants greater autonomy and independence to the military, police and judiciary—the three institutions that heavily backed last year’s coup against Morsi. The outcome of the referendum was never in serious doubt. The Brotherhood had opted for a boycott, and the only political party actively campaigning against the constitution, the Strong Egypt Party, suspended its campaign shortly before the plebiscite and switched to a boycott after several of its members were arrested for hanging up fliers urging a “No” vote. The constitution ended up passing by a whopping 98.1 percent, with a turnout of 38.6 percent. At least nine people were killed in clashes and more than 400 arrested over the two-day referendum. The next stages in the transition are parliamentary and presidential elections, slated to take place within the next six months, although the order has not been determined. The question that has dominated newspaper headlines and TV commentary is whether Sisi will run for president. A slew of leading politicians and public figures have all fawningly called on the army chief to enter the race. Sisi’s star has steadily risen in the context of his “war on terror.” The rise in Islamist militancy and attacks on security forces that have spread from the Sinai to the capital have only buttressed the role of the army and security forces in government. Indeed, the current regime is largely defined by what it is not—its raison d’être embodied in its commitment to crush the Brotherhood. The government has offered little in the way of solutions to deal with the country’s deep socioeconomic problems. For now, Egypt’s rulers have succeeded, at least temporarily, in reviving the often unacknowledged bargain of the Mubarak era: repression in exchange for stability. As January 25 approached this year, the army and police invited Egyptians to fill the streets to commemorate the anniversary of the “glorious” revolution. Several opposition groups, including the Muslim Brotherhood, called for protests. Yet there are deep cleavages among the opposition, and Tahrir Square will likely be a contested space. The Brotherhood issued a statement inviting revolutionary forces to unite on January 25 and made a tepid apology for siding with the army in the period after Mubarak’s ouster. “Though everyone made mistakes, we do not absolve ourselves of our mistake when we trusted the military council,” the statement said. Indeed, activists have not forgotten last year’s anniversary, which was marked by widespread, often violent clashes and seething anger directed at the Morsi government and his group, the Muslim Brotherhood. Those confrontations were followed by a vicious, weeks-long campaign by Morsi’s newly appointed interior minister, Mohamed Ibrahim, against demonstrators. More than 800 were arrested, including over 250 children. The Brotherhood encouraged the crackdown. Many now lament that the tide has shifted decisively away from revolutionary change, and that the country is headed toward an order even more regressive than the one people rose up against three years ago. Some of the most prominent figures who helped launch and sustain the revolution are now behind bars, including the founders of April 6, Ahmed Maher and Mohamed Adel, as well as the blogger and activist Alaa Abd El Fattah. Targeting Alaa has almost become a rite of passage for Egypt’s successive governments. He was imprisoned both under Mubarak and the Supreme Council of Armed Forces that replaced him, and Morsi’s public prosecutor issued an arrest warrant against him. This past November, two dozen armed men came to his house at night and dragged him away, beating him and slapping his wife when she asked for a warrant. Their 2-year-old son was asleep in the adjacent room. Alaa has been in prison for nearly sixty days now, held in solitary confinement for twenty hours a day. He faces charges of organizing a protest, yet no trial date has been set. In the past, Alaa’s arrests had caused widespread outrage—his supporters were given a platform on television to call for his release, while politicians and public figures denounced his imprisonment. This time, his jailing has been applauded, and the few advocates who have tried to speak out have been muted by the cacophony of jingoism gripping the country.